Uttar Pradesh will vote in all seven phases of the Lok Sabha elections 2019 scheduled from April 11 to May 19. 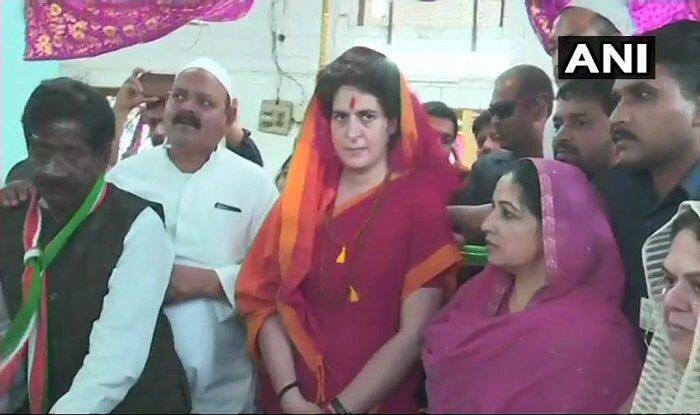 New Delhi:Priyanka Gandhi Vadra was left red faced on Tuesday as BJP supporters gathered outside a temple in Mirzapur, Uttar Pradesh raised pro-Modi slogans while the Congress general secretary was offering prayers. If reports are to be believed, hundreds of Bharatiya Janata Party (BJP) workers started shouting slogans hailing Prime Minister Narendra Modi as Gandhi got out of her car outside the Vindhyavasini Devi Temple, eight kilometres from Mirzapur. Reports claimed that the slogans continued even as Gandhi entered the famous temple to pray. Earlier in the day, Gandhi had launched a scathing attack on Bharatiya Janata Party (BJP) for questioning the performance of Congress party in the last 70 years. “There is a big difference between polls promises and fulfilling them. As far as the rant about (no development in) 70 years is concerned, it also has an expiry date. You (BJP) are in the government for the past five years, what have you done in five years? the Congress leader asked at the Sitamarhi guest house in Uttar Pradesh’s Bhadohi district, where she had a night halt. Notably, the newly-appointed Congress general secretary was referring to PM Narendra Modi and other BJP leaders who accuse Congress party of not developing the country in the past 70 years. She had also lambasted Uttar Pradesh Chief Minister Yogi Adityanath and termed his government’s report card in which it highlighted various achievements and welfare schemes in the last two years ‘fake’. “BJP need to come to the ground to see the reality. This report card and publicity looks good, but the reality is different. All sections are feeling harassed,” Priyanka said. In a bid to to reach out to the electorates, the Congress leader began her three-day boat journey from Prayagraj on Monday. She will also visit Varanasi, the Lok Sabha constituency of Prime Minister Narendra Modi. Uttar Pradesh will go to polls during all seven phases of Lok Sabha Elections 2019 which will begin from April 11. The counting of votes will take place on May 23.